The members of the Capitol building committee wanted to use materials of sufficient quantities and high quality for construction. They needed to be able to transport the materials to the work site. In 1866 state geologist Benjamin Franklin Mudge assisted in identifying a limestone bed near Manhattan in Riley County as appropriate, but with no railroads there at the time, it was not possible to ship the stone to Topeka. Brown stone from a quarry southeast of Topeka was used for the east wing cornerstone when ground was broken amid much ceremony in fall 1866. The brown sandstone failed to harden; after a harsh winter in 1867 the stone had crumbled. Light gray and buff limestone from Geary County was selected to replace the foundation and complete the wing. Stone from Cottonwood Falls was used for other portions of the building. Much of the stonework was completed on location. Topekans commented that the sounds of the chipping of stone could be heard throughout the city. The process of raising and lowering the huge building stones into place was accomplished early on through a pulley and hoist apparatus. Through repetitive motion, teams of horses passed backward and forward a distance of 75 yards, drawing a rope that turned a pulley. The hoist connected to the pulley carried the huge rock, mortar, and other building materials to the upper stories. A whistle from the foreman notified the driver of the team when to proceed forward or backward and when to stop. The horses became so accustomed to the repetition of the signals that they responded without prompting. The east wing is shorter and narrower than the west wing. German masons completed the stonework for the east wing, which was finished in 1873. The total cost of construction for the east wing was reported at $480,000. The east wing was the largest building in the state at the time of its completion. 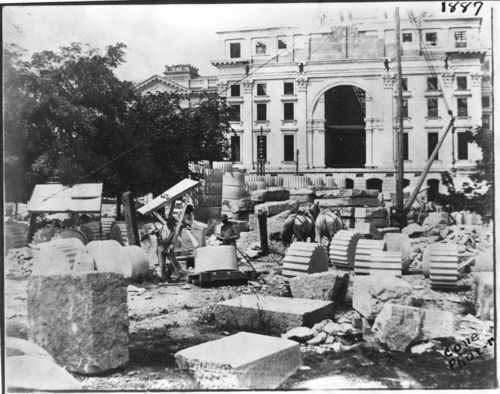 State government offices moved from various temporary locations to the new space in December 1869, while it was yet under construction. The Supreme Court was located on the first floor of the east wing. The governor, secretary of state, auditor, treasurer, superintendent of public instruction, and attorney general offices were located on the second floor. Both bodies of the state legislature met on the third floor; a wall separated the chambers. Work on the west wing began in 1879, with Italian masons involved in construction. The building was enclosed by 1880. Work was still underway when the Kansas House of Representatives first met in the hall in 1881. The wing was finished by the end of the year. The total cost of construction for the wing was reported at $317,000. Representative Hall, the larger of the two chambers, contains space for its 125 members. Nicknamed the “Cave of the Winds,” this long narrow passage captured air flow as people walked through the tunnel, enhancing the Capitol’s reputation as a “windy” place. The structure was demolished when construction began on the south and north wings and the main building. After the west wing was completed and the House of Representatives had moved to its new home, the east wing was remodeled. In 1885 the ornate Senate Chamber was created. As construction continued on the upper floors of the Capitol, the horsepower used to move heavy building materials was replaced by newer technologies. Newspapers of the day claimed the “first ever built” electric derrick was installed in 1886. The tall tower and electric motor were placed between the south and west wings. Construction on the south wing began in 1883, along with work on the north wing. Portions of the wing were occupied as early as 1892. Once the city grew beyond the downtown area to the north, many activities were held on the lawn near the south wing. In 1947 state legislators made the south wing the official entrance. The third floor of the south wing contains the Old Supreme Court; the restored space is now one of several large committee rooms. The fifth floor was once home to the Kansas Historical Society. Construction on the north wing began in 1883 along with work on the south wing. The north wing, designed as the front door, features special details including three exterior doors with the Kansas state seal made of copper inlay, and the eight fluted columns consistent with the south wing. The State Library of Kansas is located on the third and fourth floors of the north wing. The secretary of state’s office, originally located in the northeast corner of the wing, was moved to Memorial Hall in 2000. The original space is used today as a ceremonial office. The main building construction began in 1886, and construction on the dome began in 1889. A second passageway was built in 1888 to bypass the ongoing construction of the central building. These sections were generally completed in 1903, however, the north portico construction continued until 1906. In 2014 the north wing is again the main entrance to the Capitol. Considered complete in 1903, portions of the Capitol building remained under construction until about 1917.